The Education Department has opened investigations into eight universities tied to the sweeping college admissions and bribery scandal unveiled by federal prosecutors earlier this month, according to individuals familiar with the investigation. Department investigators are examining whether any of the universities violated any laws or rules “governing the Federal student financial aid programs” or “any other applicable laws,” according to a document reviewed by POLITICO. 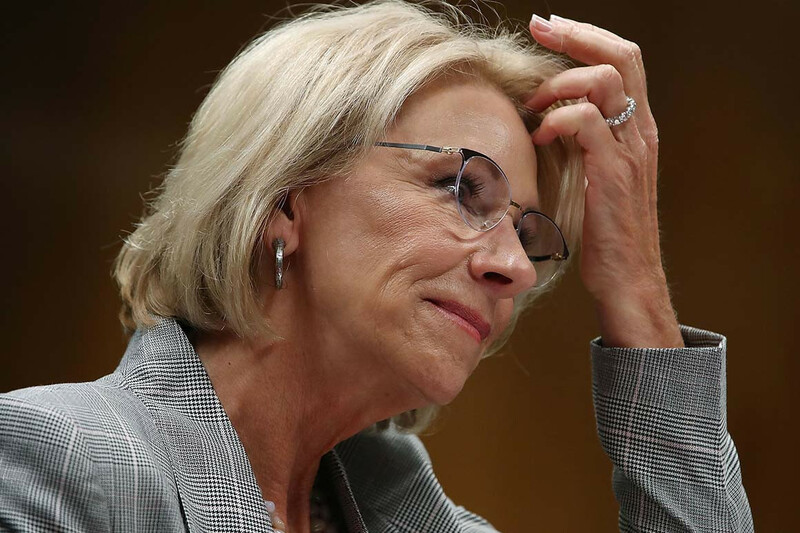 If the department decides that any of the schools violated federal education regulations, it could assess penalties, which at the most extreme would include cutting off an institution’s access to Pell Grants and federal student loans. Federal education officials on Monday notified eight universities that they each faced a “preliminary investigation” stemming from the criminal charges announced earlier this month. “The allegations made and evidence cited by the Department of Justice raise questions about whether your institution is fully meeting its obligations” under federal education laws and regulations, an Education Department official wrote. The letter was sent to the presidents of Yale University, Wake Forest University, the University of San Diego, Stanford University, Georgetown University, the University of Texas at Austin, the University of Southern California and the University of California, Los Angeles. The Justice Department earlier this month accused dozens of wealthy parents, including celebrities Lori Loughlin and Felicity Huffman, in a major cheating and bribery scheme that has rocked higher education. A dozen of the individuals charged in the case made their first appearances in a federal courtroom in Boston on Monday. Another hearing with several more of the accused is scheduled for Friday. Education Secretary Betsy DeVos denounced the college admissions scandal at the time as “disgraceful” and asked department officials to determine whether any of the agency’s own regulations had been violated. The letters sent to university presidents on Monday cite a wide range of federal education regulations and laws that investigators are exploring. They note that universities receiving federal student aid must demonstrate “administrative capacity” and have proper procedures and policies to administer federal money. As part of the Education Department investigation, officials demanded that each of the universities turn over, within the next 30 days, documents including marketing and promotional materials, statements made to organizations that rank schools, such as U.S. News and World Report, and internal control policies and procedures related to admissions for recruited athletes. Department investigators also asked the schools to identify “the names of all students whose admission” was “mentioned in the allegations raised in the Department of Justice’s investigation” as well as any disciplinary actions taken against employees charged by federal prosecutors in the case. The investigations into each of the eight colleges is being led by the department’s Student Aid Enforcement Unit, which has the power to issue subpoenas. The unit, which is meant to police fraud in higher education, was created by the Obama administration in response to abuses at for-profit colleges. Democrats have accused the Trump administration of gutting the enforcement unit and hamstringing its investigations into for-profit education companies. The Trump administration earlier this year reassigned the enforcement chief leading the unit, Julian Schmoke, who had was selected for the job in August 2017. He had been a frequent target for congressional Democrats because of his previous work at a for-profit college, DeVry University. Jeff Appel, who has been delegated the duties of chief enforcement officer until a permanent official is named for the position, is leading the investigations. Appel has served in other roles at the department, including as the deputy undersecretary of education during the Obama administration. Appel signed the letters sent to the eight universities on Monday.